Coffee in a Wake Cup at Rosie & Joe in St Giles. The space rewards those who notice. There is a long history of hospitality on the site of St Giles in the Fields stretching back far earlier than the Notes coffee barrow. But Rosie & Joe is a lovely iteration to that tradition. There’s a definite focus on tea at Rosie & Joe but the coffee is roasted by Square Mile and prepared on a La Marzocco machine. There is also a good selection of food to nibble on (as well as more food stalls nearby on weekday lunchtimes). And although it is a cart, there are a few seats and tables dotted around so it is easy to sit back and enjoy your coffee while the world races by. St Giles High St is a very busy road and yet, sitting in the churchyard of St Giles is strangely peaceful. Despite the traffic and the occasional siren, it is one of those rare places in London that you can find the stillness to listen. A beautiful place to enjoy a coffee from an independent stall in fact! And if you have your own cup with you, there is even 10p off your coffee. The coffee was smooth and sweet, fruity but definitely a sweet and full bodied type of fruity cup. But why was it so peaceful? Was it merely that it was a lovely (but breezy) spring morning when I tried Rosie & Joe? Or was it that it is a small bit of nature in a built up environment? Both of these helped but I think it is also the way that the place rewards those who notice by offering more each time you look. The ghost sign hidden behind the tree just outside the churchyard. There’s the, perhaps slightly grim, history suggested by the fact that the ‘garden’ is significantly raised above the level of the pavement in parts. There’s the brickwork and stone walls of the church itself of course. The ‘ghost sign’ on a nearby building that is revealed to the coffee drinker by the fact that the tree between us and it has not yet got its summer leaves. And then the nod to the history of the site hinted at by the coffee cart itself: Since Matilda, wife of Henry I founded St Giles’ leprosy hospital on the site, a “cup of charity” was given to condemned prisoners as they made their way past St Giles on their way to their execution at Tyburn*. Very different now, but the tradition of refreshment for the traveller is continued. But then a fire engine’s siren reminds you that you are in a cosmos, a universe filled with beautiful physics. You know whether the fire engine is approaching or has passed away from you from how the pitch of the sound changes as it goes past. The Doppler shift meaning that sound waves travelling towards you have a shorter wavelength (higher frequency, higher pitch) than those travelling away (longer wavelength, lower frequency, lower pitch). And part of the beauty of physics is that it is so universal; what works for sound also works for light. If an object emitting light is moving away from us, the light appears to have a longer wavelength (lower frequency, it is red-shifted) than if the same object were stationary or moving towards us where it would appear as if it emitted light with a shorter wavelength (higher frequency, blue shifted). So, similarly, if we were to look at the surface of a rotating planet and saw how the light reflected off that planet’s surface, the side of the planet that was rotating towards us would look ever so slightly bluer than the side rotating away from us which would look slightly redder. And if the planet’s surface was like Venus and obscured by clouds (rather like the ghost sign at Rosie & Joe will be obscured by leaves in a couple of months time) we could use the reflection of radio waves from the surface rather than visible light to see the same red-shift/blue-shift in the radio waves as the planet rotates**. In this way we could determine the direction of rotation of the planet and how fast it was rotating just as we get an indication of the speed of the fire engine from listening to the sound of the siren. The siren takes us from a consideration of inner stillness to a recognition of the scale of the universe. Which is rather apt for a cafe in a churchyard, where the architecture of a church is often designed to be read symbolically, from the person to their place in the grand scheme of things***. 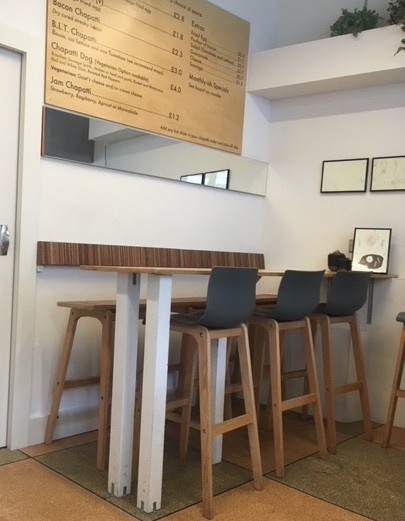 One great thing about this particular cafe though was how much there was to see that cannot be included in this cafe-physics review for reasons of space. The location truly rewards those who pay attention to what they notice here. I can only recommend that you take some time out, take your re-usable cup and go to find some time to enjoy your coffee (or tea) in this quiet space in central London. Rosie and Joe can be found in St Giles in the Fields churchyard, Monday-Friday. It was not what I had expected. Entering the door of the Cafe from Crisis, you go up a ramp with a bench running alongside it before the counter looms in front of you with a large café space opening up to your right (previously partially obscured from your view by the wall for the ramp). Perhaps it is fitting that my expectations were wrong. Many of us have ideas about the homeless (why they are homeless, what homelessness is etc) that may not match fully with the reality. And this café is, after all, in the head office of Crisis, a UK national charity working with the homeless and homelessness. The coffee is roasted by Volcano and there are a large number of food options (including vegan and veggie) and cakes at the counter. A selection of keep cups are also arranged in a rack on the left of the counter, should you not have one yet. We ordered an Americano and tea (to stay) and took our numbered wooden spoon to the table so that they could find us. Although it was late lunchtime and busy, the drinks arrived fairly quickly with the coffee in a (Crisis themed?) red cup. Apparently serving coffee in red cups make us perceive the coffee as warmer than if it is served in a blue cup. Whether this is true or not, the warm brew was very welcome on this cold January day. The café is situated on a street corner which means that it has many windows, each topped with a shallow arch. The building looks fairly modern from the outside, but the arches were reminiscent of the way that older buildings can be dated by the window style, along with other features. The Cure played in the background which entertained my tea drinking companion but made me wonder about the ideas of Pythagoras on the psychological impacts of different sorts of music (and whether it affected the ability to find thought connections in a café). It turns out there are many things to notice in this photo. From the bricks to the self-defence tactics of plants. But what about the nature of the home of the plant? As we sat, enjoyed our drinks and looked around, we noticed that some plants had found a home in coffee cups placed on the tables around. 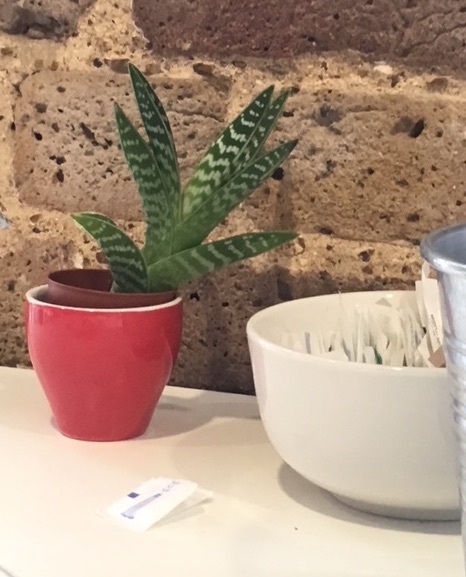 Small plants in plastic pots (a nod to the anthropocene as pointed out by @lifelearner47 on twitter) were dotted around the café. Did they move from an espresso to a long black cup as they grew larger? Perhaps it was the spiky plant in one of the pots, but my mind immediately jumped to hermit crabs and their search for a new shell each time they grew a bit bigger. Marine hermit crabs have been shown to be happy in any old discarded shell. Normally these are the ex-homes of gastropods that have, well, “moved on” would be a euphemism, but marine based hermit crabs have been known to make their shells out of all sorts of things including our plastic litter. Land based hermit crabs however are far more demanding and only move into shells that have been specially remodelled by earlier generations of hermit crabs for their own use. This means that land based hermit crabs have to develop a social awareness of other hermit crabs when they want to swap shells. Apparently the interaction goes something like this: A group of hermit crabs come together in a small-ish area and begin to scope each other out. The loose collection becomes a cluster as the crabs explore whether one of the larger crabs can be evicted from its shell. As the process of eviction is about to occur, the remaining crabs (which can number quite a few, 10 or more) literally ‘line up’ in order of shell size so that, when the largest is evicted, each crab can move up to the next sized shell leaving the smallest, most undesirable shell on the seashore and the poor evicted crab, shell-less. Several questions arise but one is, do the crabs make decisions, “to stay or to go” based on how advanced the eviction process is? So, say a crab wanders into an area with an unusually large number of crabs in it (perhaps 4) but the crabs are all lined up in a queue ready to swap into each others shells. Do the crabs coming into the area stick around for a long time or do they head off somewhere else? Or, conversely, what if they enter an area where there are more than the usual number of ‘colleagues’, but they are all scattered about, not yet ready to evict the largest crab. What would our incoming crab do then? What would you learn if you noticed the connections your mind was forming while enjoying a coffee? These questions were addressed by a group working with the terrestrial hermit crabs of Costa Rica. By defining five cells on the beach, each with a different arrangement of (empty but inaccessible) shells that the incoming hermit crab may want, the researchers found that the incoming hermits were making some strikingly sensible decisions. When the crab came into a region of scattered shells (that the incomer mistook for fellow crabs owing to a trick with a combination of loctite glue and partially burying the empty shells that the researchers used to fool the incomers), the incomer tended to stick around, waiting for an opportunity to swap a shell. If the incomer came but saw that the queue of shells had already formed, it still stayed a bit longer in the region relative to a control area devoid of shells, but it did tend to leave it after some time, perhaps to look for new shells elsewhere. The researchers concluded that when the crab came into an area and thought it had a pretty good chance of inserting itself into a good queue position, it would stay in the area waiting for the eviction to occur and the shell swapping process to start. However when the crab came into an area where the queue had already formed, it was unlikely to be able to get a good position in the queue and so would investigate the situation for a bit before wandering off elsewhere in the search of a new shell in a different area. Does this have any relevance to a café trying to do a bit to address the problems of homelessness and the homeless in our city and country? I will leave that to each reader to ponder. However, it was a great opportunity to learn something new about our world, which only happened because I stopped to notice something in a café and then wondered how hermit crabs get their homes. It’s always good to slow down and notice things. What will you see next? 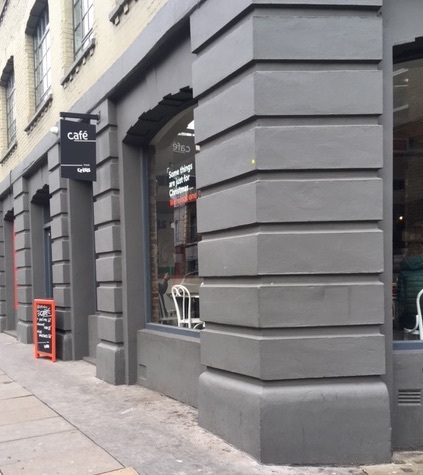 Cafe from Crisis (London) is at 64 Commercial Street, E1 6LT. Telling the time with an Aeropress? The first stage of making coffee with an Aeropress is to immerse the coffee grind in the water. 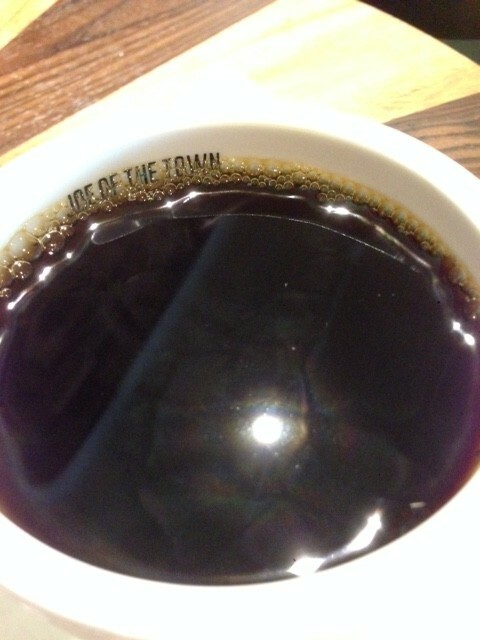 Here, the plunger is at the bottom of the coffee. On occasion, it takes a change in our routine for us to re-see our world in a slightly different way. And so it was that when there was an opportunity to borrow an Aeropress together with a hand grinder, I jumped at it. Each morning presented a meditative time for grinding the beans before the ritual of preparing the coffee by a different brew method. Each day became an opportunity to think about something new. Perhaps it is not as immediately eye catching as the method of a slow pour of water from a swan necked kettle of a V60, and yet making coffee using the Aeropress offers a tremendously rich set of connections that we could ponder and contemplate if we would but notice them. And it starts with the seal. For those who may not be familiar with the Aeropress, a cylindrical ‘plunger’ with a seal tightly fits into a plastic cylinder (brew guide here). The first stage of making a coffee with the Aeropress is to use the cylinder to brew an ‘immersion’ type coffee, exactly as with the French Press (but here, the plunger is on the floor of the coffee maker). 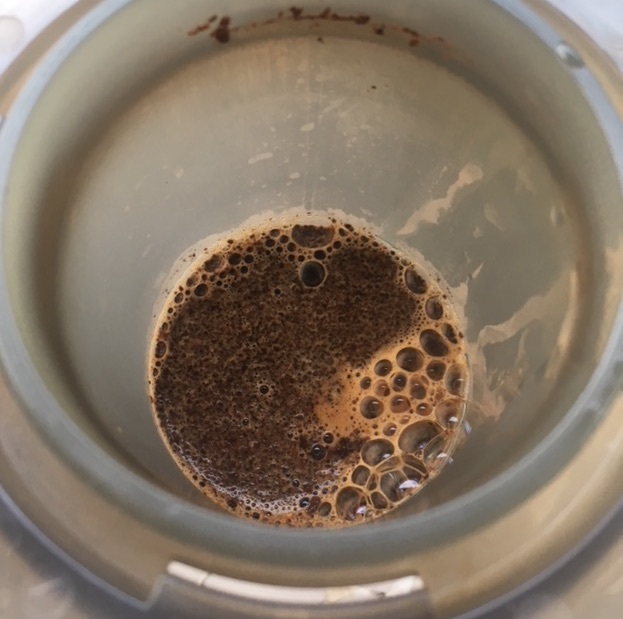 Then, after screwing a filter paper and plastic colander to the top of the cylinder and leaving the coffee to brew for a certain amount of time, the whole system is ‘inverted’ onto a mug where some coffee drips through the filter before the rest is forced out using the plunger to push the liquid through the coffee grind. Immediately perhaps your mind could jump to water clocks where water was allowed to drip out of two holes at the bottom of a device at a rate that allowed people to time certain intervals. It is even suggested that Galileo used such a “clepsydra” to time falling bodies (though I prefer the idea that he sang in order to time his pendulums). With many holes in the bottom of the device and an uneven coffee grind through which the water (coffee) flows, the Aeropress is perhaps not the best clock available to us now. 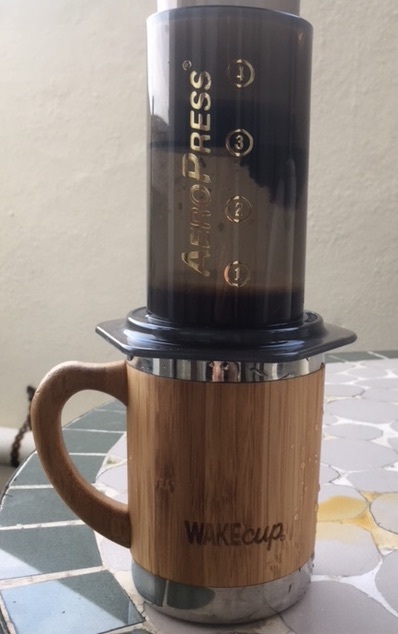 However there is another connection between the Aeropress and the clepsydra that would take us to a whole new area of physics and speculation. When the medieval thinker Adelard of Bath was considering the issue of whether nature could sustain a vacuum, he thought about the issue of the clepsydra¹. With two holes at the bottom and holes at the top for air, the clepsydra would drip the water through the clock at an even rate. Unless of course the holes at the top were blocked, in which case the water stopped dripping, (a similar thing can be observed when sealing the top of a straw). What kept the water in the jar when the top hole was blocked? What kept it from following its natural path of flowing downwards? (gravity was not understood at that point either). Adelard argued that it was not ‘magic’ that kept the water in when no air could go through, something else was at work. The Aeropress inverted onto a coffee cup before the plunger is pushed down. Complete with coffee stain behind the cup where the inversion process went awry. Now, we would argue that whether the water flows down and out of the Aeropress, or not, depends on the balance of forces pushing the water down and those pushing it up. The forces pushing the water down and out of the clepsydra, or Aeropress, are gravity and the air pressure above the water in the cylinder. Pushing it up, it is only the air pressure from below. 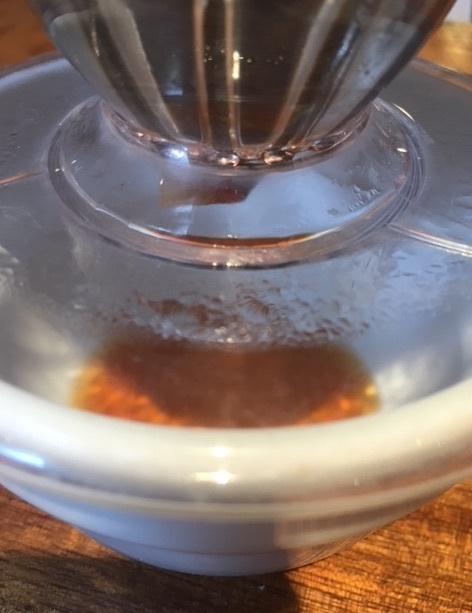 Ordinarily, the air pressure above and that below the water in the Aeropress are quite similar, gravity wins the tug of war and the water flows out. 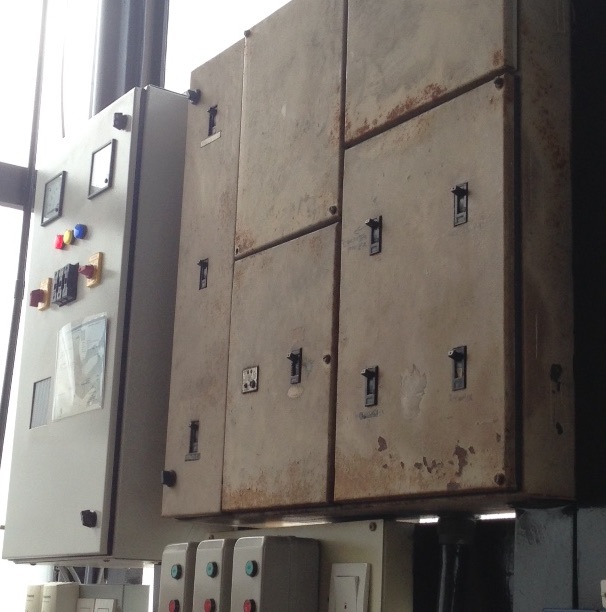 In an enclosed system however (if the holes at the top are blocked), were the water to flow out of the bottom, the air pressure above the coffee space would reduce. This makes sense because, if no new air gets in, the same amount of air that we had before now occupies a larger volume as the water has left it, the pressure exerted by that air will have to be less than before. A reduced air pressure means a reduced force on the water pushing it down through the filter and so the force pushing the water down can now be perfectly balanced by the force (from the surrounding air) pushing the water up: the water remains in the Aeropress. The only way we get the coffee out is to change the balance of forces on the water which means pushing down the plunger. But perhaps it is worth stepping back and imagining what the consequences could be of having the idea that the universe was just full of something that had to be continuous. You may find it quite reasonable for example to consider that vortices would form behind and around the planets as they travelled in their circular orbits through this ‘something’*. Such vortices could explain some of the effects of gravity that we observe and so there would perhaps be no urgency to develop a gravitational theory such as the one we have. There would be other consequences, the world of vacuum physics and consequently of electronics would be significantly set back. In his lecture for the Carl Sagan Prize for Excellence in Public Communication in Planetary Science, The Director of the Vatican Observatory, Br Guy Consolmagno SJ explored previous scientific ideas that were almost right, which “is to say wrong” (You can see his lecture “Discarded Worlds: Astronomical Worlds that were almost correct” here) If it is true that so many scientific theories lasted so long (because they were almost correct) but were in fact wrong, how many of our scientific ideas today are ‘almost correct’ too? It makes you wonder how our preconceptions of the world affect our ability to investigate it. And for that matter, how our ability to contemplate the world is affected by our practise of doing so. They say that beauty is in the eye of the beholder. For that to be true, the beholder has to open their eyes, look, contemplate and be prepared to be shown wrong in their preconceptions. 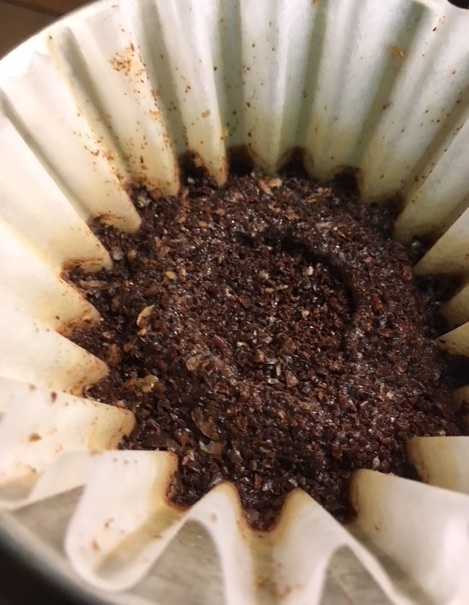 What connections do you make to your coffee brew each morning? I’d love to know, here in the comments, on Twitter or over on Facebook. * Does a connection between this and stirring your freshly brewed Aeropress coffee with a teaspoon trailing vortices stretch the connectivity a bit too far? ² Quoted from Adelard of Bath’s “Quaestiones Naturales” taken from Much Ado about nothing, page 67. A friend recommended that we try a café in her neighbourhood near Outram, in Singapore. So, with some time to spare we walked up the hill and into the welcoming air conditioning of The Populus Cafe in Neil Road. The coffee is roasted by 2º North and there is an extensive menu of both coffee based drinks and a seasonal filter selection. There was also a range of iced drinks on the menu which in the Singapore heat were tempting, but I opted for the 6oz Long Black. Given more time, or a second visit, I would certainly try the filter, but this time an appointment across the island was calling. 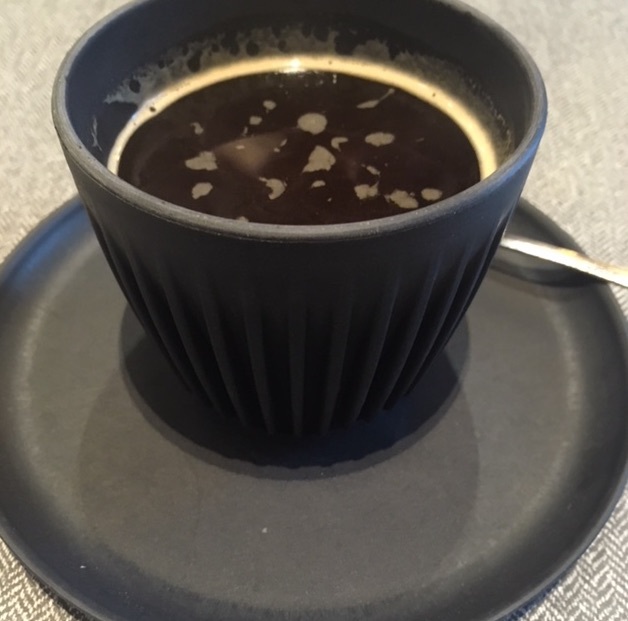 There seemed too to be a very good lunch selection on the menu, but again, the lunch appointment elsewhere meant that it was just the 6oz long black that day. 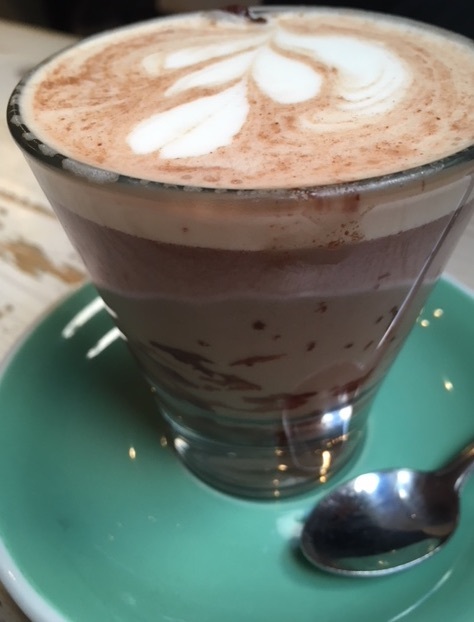 It should be possible to take some time back from a busy schedule full of appointments and concerns and sit back and ponder the connections in any café. Having run from one set of concerns and soon to have to go off to another, would this be possible in 30ºC+ heat? The comfortable space of Populus provided a perfect place to test this question. 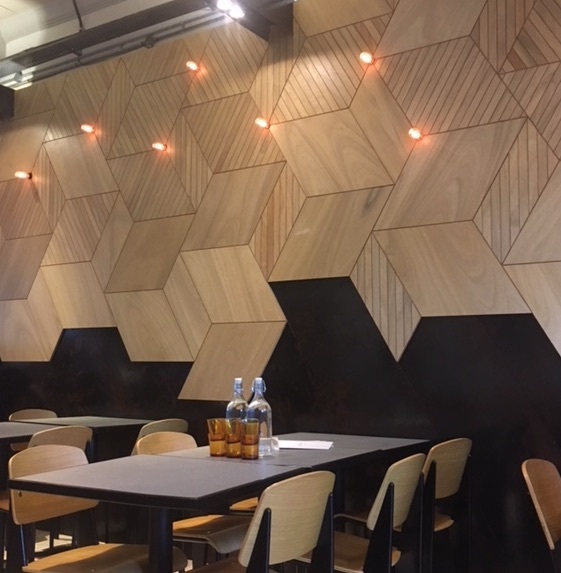 Sitting back while sipping my coffee, the first thing that struck me was the wood, arranged in different geometrical patterns on the walls. 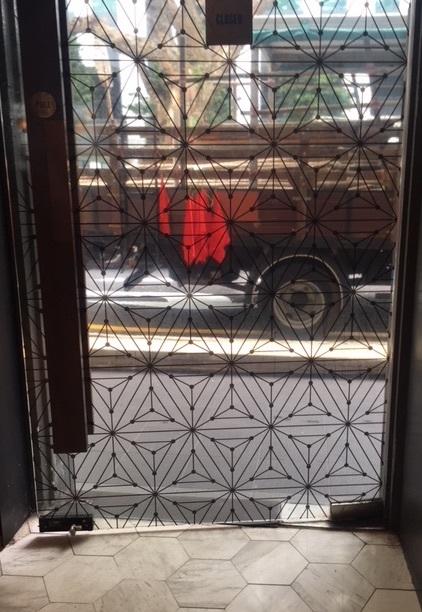 The floors too were decorated with hexagonal stone tiles while the door was glass. 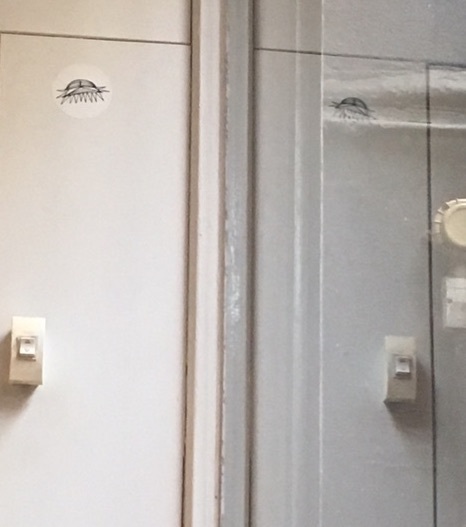 There was a different pattern on the door, but what was it? Staring at it for a while, I thought about the schematics you sometimes see for a connected world, each of us a point connected to the others (how true is it that we are all 6 hand shakes away from everyone else?). 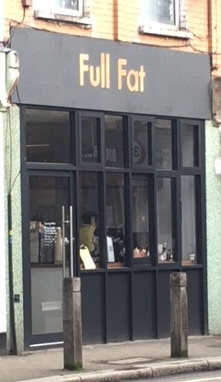 Maybe this fitted with the name of the café? My companion in these reviews instead thought of crystals and the way that crystal structures are represented with lines between the atoms. While loading the photograph of the door onto the website, I saw a pattern of flowers. It seems that the pattern on the door formed and reformed with each new view. Looking through the door of Populus. What patterns do you see? Then there was the cup. 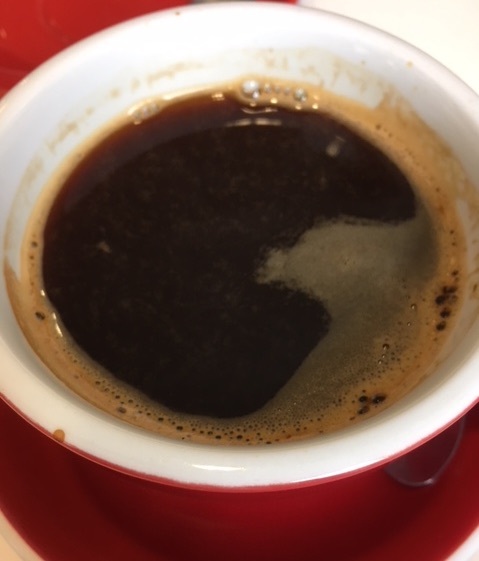 A black coffee in a black cup, with umbral and penumbral shadows (as pointed out by @Bob_MatPhys on Twitter). A few years ago there was great excitement about a new material that had been made to be blacker than any known material. The substance used a coating of carbon nanowires (of just 20nm diameter which is about 1/1000 the size of a grain of espresso grind) to absorb light across the visible, ultra-violet and infrared spectrum. And just as nano-structuring a material helps it to appear the ‘blackest’ object ever, so changing the structure of a material can make it invisible to other parts of the electromagnetic spectrum such as microwaves. Quite why various defence companies and governments would invest so much into this research I will leave for your imagination (it is not to avoid heating soup). A more peaceful and beautiful side of the effect of nanostructure on optical properties is the way that the feathers of a peacock have a striking green-blue hue. It is another example of light interacting with a structure and so producing different optical effects; all is not as it appears. A black coffee in a black coffee cup. But what does black mean? And is something that is transparent always so? 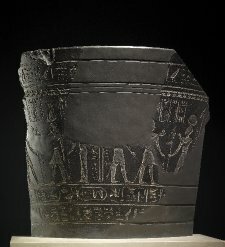 And the fact that all is not as it appears gives another connection to the Populus cup. For although it seemed quite black to my eyes, it was clearly shining in the infra-red. The hot coffee inside was radiating through the cup and onto my hands. Which could prompt us to consider what ‘black’ really means? And for that matter, what about transparent? Just as ‘black’ only absorbs light over a certain set of frequencies, so transparent only lets light through over certain frequencies. The door that we can see through with our eyes may be opaque to a different frequency range that we cannot see. Just over two hundred years ago Carl Wilhelm Scheele deduced the presence of the infrared by contemplating how his stove heated him in the winter. Although he could not see them, the ‘heat rays’ seemed to come straight towards him and yet did not cause a candle flame to flicker, clearly the heat was ‘radiating’ like light rather than travelling like a breeze on the air. The knowledge that structure, as well as pigment, provides the colour to our world, or that what is transparent at some frequencies may be opaque to others, these things give us plenty to think about, scientifically and perhaps more philosophically, while enjoying our black coffee. Which shows that even ten minutes spent sitting with your coffee can result in a series of thought connections that you may not have enjoyed had you rushed from appointment to appointment while checking your smartphone. That we could all enjoy a good ten minutes (or more) in the Populus Cafe! It’s been a bit of a slow start to January, with no post since 2018, sorry! A decorated door, but what connections do you make? While looking inside the café, you are greeted with these patterns on the wall. What strikes you? What do you think about? I think there are a number of avenues for possible thought trains. Where would your thoughts go if you just sat here in Populus and pondered? There are many ways in which rainbows of colour are produced as light interacts with our coffee or in a cafe. Looking around yourself now, how many do you see? What physics underlies each? As the nights grow longer and the days colder, we notice that windows steam up as the water vapour in the café condenses onto the cooler glass. Perhaps we see a similar thing on our glasses while we are drinking tea or on the windows of a bus. Initially we perhaps become frustrated at our inability to see what is going on outside but then we notice the colourful patterns around the lights of passing cars and of street lights. Haloes of coloured light around a central bright spot. 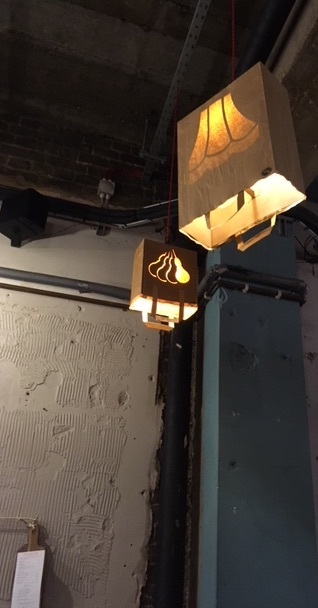 What does this tell us and where else can we see it, either in a café or in life generally? On a window pane, a large number of small droplets of water have condensed into what appears to us as a fog on the glass. As the light shines through from the car headlights, each droplet acts as an obstacle to the light and so bends it. 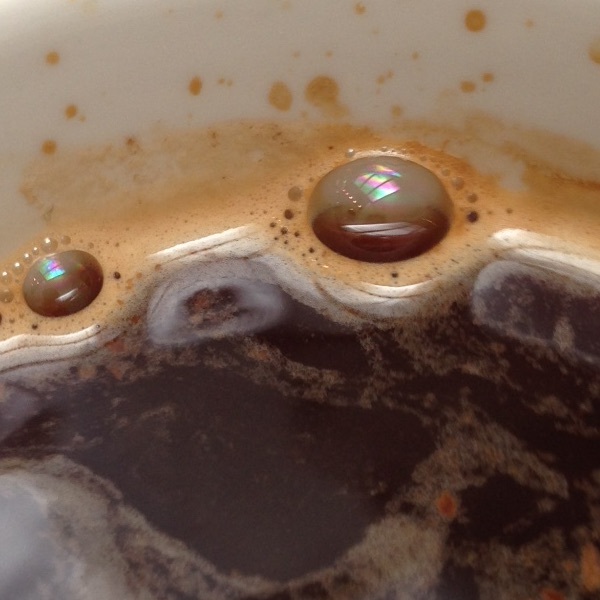 You could see a similar effect with the waves on the sea going around stones or perhaps if you brew a large cup of coffee with the surface waves going around a spoon (let me know if you manage to see this bending in a coffee cup). The amount that the light bends is dependent on the wavelength of the light (look carefully at the waves going around obstacles in ponds to see this) and so different wavelengths (different colours) get bent by different amounts and interfere with each other at different points – a spectrum is produced. It is a phenomenon known as diffraction. Not all beans are equal! 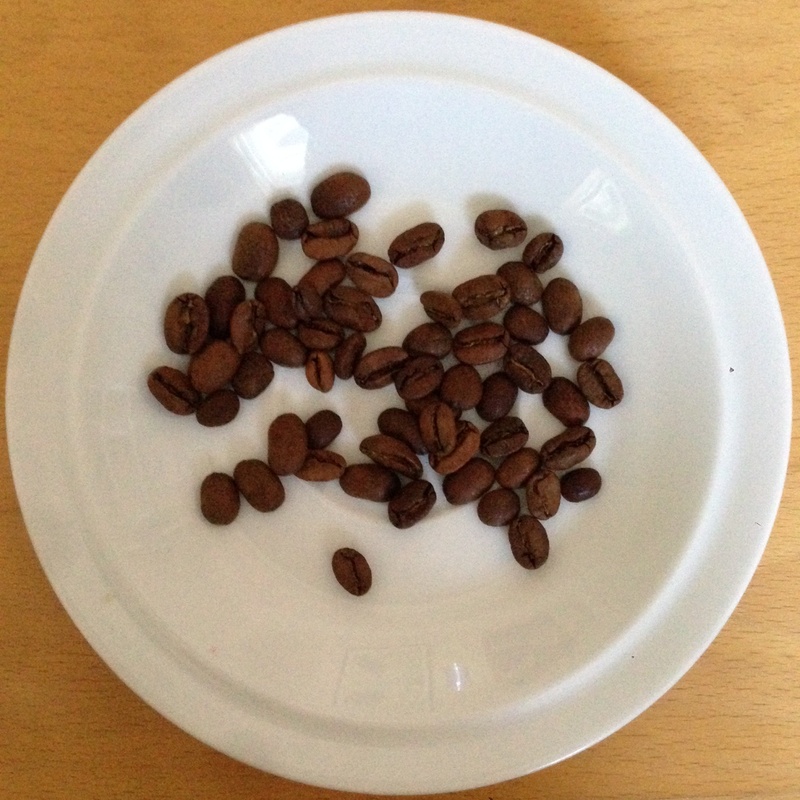 How could you quickly distinguish between arabica and robusta beans? This phenomenon means that we have a way of separating the frequencies (or wavelengths) of light. And so this means that we have a way of measuring the chemical composition of some substances as different chemicals absorb different frequencies and so have ‘fingerprints’ in the light they scatter. By passing the light scattered from a substance (such as arabica coffee beans compared to robusta) through a diffraction grating (which is an obstacle with a pattern of fixed size), we can separate the frequencies being scattered and see if any of them are ‘missing’ (ie. they have been absorbed by the material we’re studying). It would be a bit like looking at that rainbow pattern in the café window and not seeing blue, its absence tells you something. This is one of the ways that robusta beans can be quickly found if they have been substituted for arabica beans in coffee trading. Look carefully: Sometimes you can infer the existence of a thin (white) mist over your coffee by the corona pattern around reflected light fittings. But it is not just its technological aspect that has interest for us surely? When gazing at the moon on a misty evening, the halo around the moon suggests the clouds between us and it. It is something that poets have remarked upon to evoke atmosphere, it is something that we can gaze at as we imagine the giant café window of our atmosphere. But the size, and distinctness of the lunar corona actually give us clues about the droplets making up the cloud. And then we look closer to home and to our own coffee and we see the same diffraction pattern again looking back at us from our coffee’s surface. Occasionally it is possible to see haloes on the coffee surface around the reflection of overhead lights in the café. A coffee corona! This reveals to us the fact that there are droplets of water above the surface of our coffee; an extra layer of hovering droplets. Something that we can sometimes see more directly in the dancing white mists. Diffraction is a beautiful phenomenon that allows us to gaze and to contemplate how much we are able to deduce and how much we have yet to understand. How atmospheric our coffees and cafés are and the journey of understanding that we have taken to get to this point. Coffee gazing is a hobby that should be taken up by far more of us. Please enter your email address here if you would like to hear about future Bean Thinking events. A good coffee is a solid foundation for any afternoon’s noticing. A cafe-physics review with a difference. In that, it’s not so much a review as an invitation. What do you notice in a café? Last week, I had the opportunity to try Artisan’s Ealing branch. Although I had found a lot to notice on my previous visit to the East Sheen branch, I had a very specific reason for visiting the Ealing location of this small chain of four cafés. The coffee (espresso) was reliably good. Smooth and drinkable in a friendly atmosphere. Just as with the café in East Sheen, there were a good selection of edibles at the counter and plenty to notice. The light shades were immediately outstanding as something to notice while a framed ‘hole in the wall’ provided a conversation point. The café was very busy and while there was plenty of seating with many tables, we were still lucky to have got a table for two near the back. Behind us there was a lesson going on in the coffee school while on the wall was the calendar for the space booking downstairs. And it was this that I had come here for. A couple of months ago, Artisan announced that this space would be available to rent to provide a friendly space (with coffee) for the meetings of local small businesses or charities. This stayed in the back of my mind for a while as it came about at roughly the same time as an idea for Bean Thinking. First the obvious. Immediately striking, these lampshades could provide several avenues for thought. There are a couple of us who are interested in meeting, about once a month, to discuss science. As ‘science’ is quite a big subject, we thought we would limit it to science that is associated with coffee or with the café at which we are meeting. Perhaps readers of this website may realise that this is not such a restriction, it is quite easy to connect coffee to the cosmic microwave background radiation of the Universe or to chromatography and analytical chemistry. If we were to meet in a location such as Artisan, there should be plenty more food for thoughts. 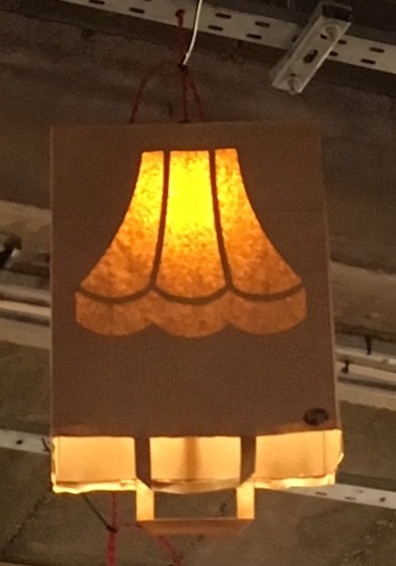 The lampshades prompted me to consider what made substances opaque or transparent? Where is the link to coffee and methods for measuring the coffee extraction? The hole in the wall suggested thoughts about the algorithms behind cash machines. I’m sure that there is plenty more to notice if we take the time to see it. And so this is an invitation. Would you like to join us in exploring what we each notice about the science of our surroundings? The plan would be to meet once a month, probably starting late January 2019 or early February (date and location to be confirmed). An afternoon on the weekend is probably better than an evening and we’d probably stay for an hour or two. You do not have to be a practising scientist to come along indeed, it would be great if we could have people from a variety of walks of life. The idea is not (necessarily) to answer scientific questions that we each may have but instead to explore the science behind the questions, to find the connections that form our ideas of the universe. To really notice our surroundings and our coffees (tea drinkers would also be welcome). As a consequence of this, mobile phones/laptops etc. will be discouraged during the afternoon. We’d like to notice things around us and not be distracted by what a search engine suggests about it; if we think a search engine could help us, we’ll use it after we’ve left and come back the following month to discuss the issues further. So, if you are curious, would like to explore what you notice and can tolerate keeping your phone on silent and in your pocket for an afternoon, please do come along, it would be great to meet some of you. You may like to look more closely at this photo. How are the menus supported? What does that tell us about the history of science? In order to understand whether there would be any interest in this idea and to hear your input about the format, content, location, time etc. I have set up a mailing list for these cafe-science-spaces. Please do sign up to the mailing list to hear the latest announcements concerning these events and also to email me back to contribute your opinion. You can sign up to the mailing list using the sign up form below. Alternatively, if you don’t want to sign up to the mailing list but do want to hear more, I will be advertising the events on Twitter and Facebook so please do feel free to follow me there. 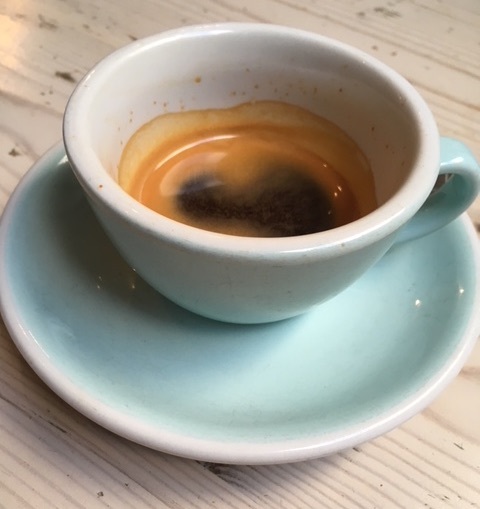 A deliciously intense and fruity espresso from the ‘specials’ menu at Curators Coffee. Curators Coffee in Margaret St in Fitzrovia has been there for years. A great location just off of Oxford St, with plenty of seating and good coffee, and so it is perfect to pop into, unless you are like me and avoid the Oxford St area as much as possible. Which perhaps explains the rarity of my visits. I first popped into Curators Coffee a couple of years back (before the laws on allergen information came in) when I remember enjoying a lovely long black but couldn’t have a cake because the people behind the counter that day couldn’t tell me which (if any) cakes contained nuts. At the time, I sat upstairs and noticed the graphene type arrangement of hexagons around the back of the space and the Bramah’s 300 years of coffee makers book in a rack at the back. I had wanted to return to properly cafe-physics review the place at a later date (and try the cake) but circumstances (and Oxford St avoidance) meant that I never got round to it. Until very recently. This time, I noticed that there were three single origin coffees available to try as espresso. Glancing at the tasting notes it was a fairly quick decision: “chocolate”. 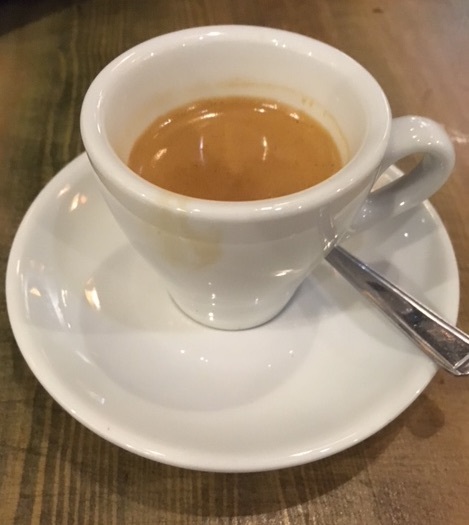 And although this time I had just had lunch and so passed on the cake, it appears that the espresso choices regularly rotate, offering an incentive to come back again and try something new. Although the café is quite large, with plenty of seating, it seems that it is also very popular. And so there were no spaces remaining upstairs. Fortunately, there were more seats downstairs and so, taking our table number with us, we made our way down the stairs and found a table at the window, as if it was waiting for us. A UFO reflected in the window? Why? What? Why (again)? It is small details such as this that reward you as you put down your smart phone and notice your surroundings. 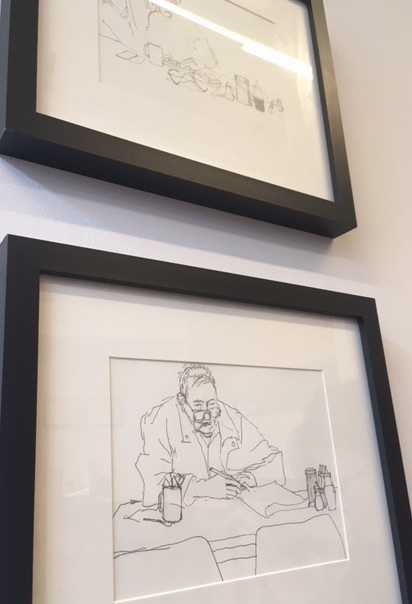 Perhaps it is obvious that a café called Curators should have art work adorning the walls. That, and the spotlights that highlighted the work immediately caught our interest, (although it was odd to see that one of the rows of spotlights was almost devoid of bulbs). The exhibition downstairs seemed to have a tilt towards street art and a couple of decorated aerosol cans were on the windowsill priced at £15 each. Was this the time to consider why an aerosol gets cooler as you spray the walls with it? 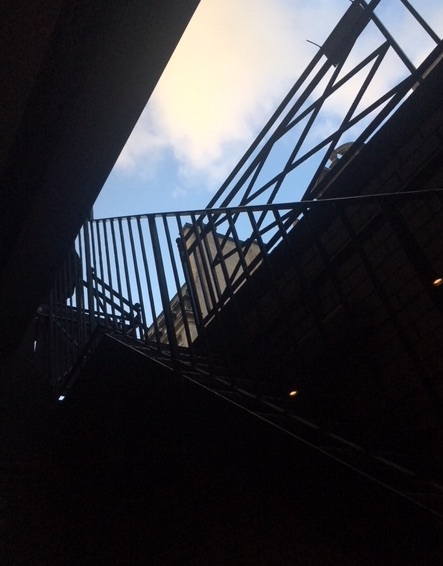 Outside the window, a staircase leading up to the street outside had railings in straight lines leading up towards a blue sky. Inside, a space craft was reflected in the window. Indeed, on checking again, there was a spacecraft, like a cartoon of a stereotypical little UFO, drawn onto the wall behind my accomplice’s head and reflected in the window next to it. What could it mean? Regardless of whether some UFO incidents are associated with visitors from other planets, there are a large number of scientific thought trains we can take when considering a UFO reflected in a window. To start with, how likely is it that we are alone in the universe or that there are many other intelligent life forms in other planetary systems? The question has been answered on the basis of probability for many years. But recently, we have been finding more planets orbiting stars and crucially, more planets that are in the ‘habitable’ zone around other stars. Assuming that life elsewhere needs similar conditions to the earth’s in order to thrive, the idea of life elsewhere is becoming increasingly real. If you see straight lines such as this, it is fairly sensible to infer that they were built by an intelligent life-form. Can you see canals on Mars? Closer to home, there were even suggestions that Mars may support flowing water, thought to be a host for bacteria based life. And although these interpretations of the flow patterns observed on the Martian surface have more recently been contested (could they instead be flowing sand? ), we continue to send probes (such as the Insight probe that landed recently) to the red planet to investigate its geology. Did Mars once host life? Mars of course has a resonance in science fiction for being the planet hosting extra-terrestrial life. HG Wells imagined the Martians landing just south of London, and eventually being killed off by exposure to bacteria on earth that they had not experienced in their Martian habitat. Could life on Mars suggest a (tenuous) further link to this café on Margaret St? Perhaps one reason that people started to imagine (intelligent) life on Mars came about because of an interesting mistranslation of an astronomical observation. While gazing at Mars in 1877, Schiaparelli noted ‘canali’ on the Martian surface. The correct translation of this in this context into English is “channels” but what the observation came to be known as was “canals”. Canals imply an intelligent builder, and hence life on Mars. Later observers also saw these ‘canals’ and a popular myth was born. It is a useful lesson for us all, sometimes how we see something can be influenced by the language we use to describe it. We photograph our coffee, and share it with our online friends. But would putting down our phone in a cafe be worth something for the planet as well as for ourselves? How many batteries do we need? And then one final thought train, prompted by photographing the cafe with my mobile phone. The whole probability argument rests on two assumptions. The first is that there are other planetary systems (which we are finding). The second is that life is fairly easy to start, or at least, that the chances of producing life are not restricted to one planet a short distance away from the Sun; we are not unique. As yet we don’t know whether this assumption is justified but discoveries such as the deep sea hydrothermal vents challenge our preconceptions about the requirements for life and suggest that life could start more than once, and so could very well start on other planets, not just ours. In these vents, bacteria are known to convert what we think of as toxic chemicals into energy in a process known as chemosynthesis without the need of sunlight or other ingredients that we had thought essential to life. Could similar hydrothermal vents on other planets host new life forms? And in a related way, what is going on with these vents? Is new life being created even now in the deep sea? In which case, what do we think about deep sea mining? If our aim is to reduce our carbon dioxide emissions by using more re-usable objects and renewable energy sources, we will require more batteries and batteries require (among other things) cobalt. If we are all to keep using mobile phones to photograph cafés, we too need the batteries which rely on these elements. A number of companies have realised that there is a vast untapped resource under the sea if only we could dredge it up. This may be easier or ultimately cheaper than recycling the old batteries. It may destroy a few hydrothermal vents or stir up the sea bed but what concern is that to us if we can gain access to more cobalt to allow us to have more batteries to allow us to all be ‘greener’. Indeed, of what concern is that to us?